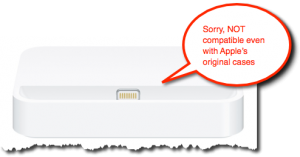 – Apple wants you to take your phone out of the case when you want to charge it on a dock. Why? Total mystery. 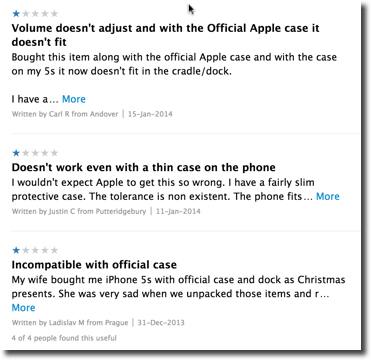 – They want you to exercise putting your iPhone in an out of the case so you don’t forget how to do it. Really? – Apple thinks you haven’t done anything all day long and it will be fun to take your phone out of the case every day to charge it, besides, maybe they are more lucky and you end up breaking your original case (which was not cheap at all) and you will need to buy another one soon. – They want you to take you phone out of the case so that you have more risk to drop it to the floor and then buy a new iPhone. We can go on forever like this with this nonsense arguments on why Apple authorizes or creates Docking stations for their own iPhones that are incompatible with their original cases and bumpers, but probably until they say why they did it, we would be just guessing. When they tested the other model (previous version) designed for the iPhone 5 that also has an audio port this seemed to work pretty well for them because it doesn’t have the extra plastic around the connector. 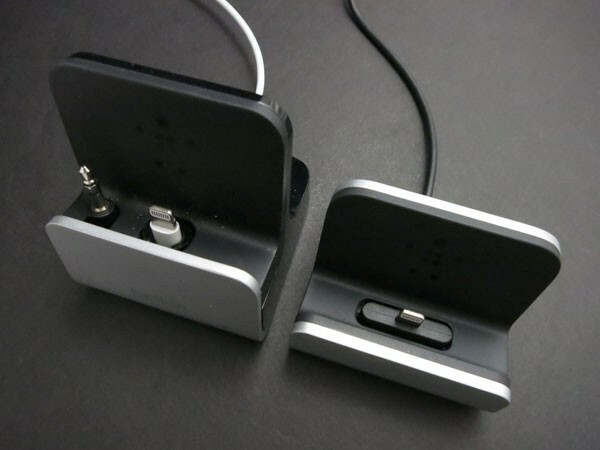 I tested this myself, the iPhone 5S of the left is my wifes and she uses the latest Belkin’s dock (without audio port) without any troubles with her case. Although as you can see her case is different from mine (right side) because her lightning connector is free from any case obstruction. When I tried my phone with its case with her dock, it wouldn’t reach the connector to start charging, it just didn’t work. Note: I am using and Xquisit case for now. The other dock that makes possible to charge your iPhone 5 / 5S with your case is the HighRise from Twelve South, you can read a full review of it here. Also an alternate dock is produced by Sinjimoru, another Korean brand that produces an Aluminum dock and for what I could read in Amazon it seems to work fine with slim cases, but not so well with bigger ones. I tried to search on AliExpress and DX.Com well known China online shops to check if they had anything like this, but I was unable to find any dock compatible when the phones are on cases or bumpers. UPDATE: I found a dock that might be compatible to work with a case, at least they claim so. It costs only USD 11 so I will give it a try, I purchased it to test it, will update this post as soon as I receive it in around 15 days. Check it out here. UPDATE 2: A colleague at work commented me he supported a project on KickStarter that gave birth to the docks from: http://www.fuzdesigns.com/ the only detail is that they cost USD 50 ! I am surprised that very few companies actually have compatible models, I believe this is a very interesting market that if well marketed, could be a guaranteed success, specially for cheap producers in China. Do you use a dock compatible with a case? Please share it below so we can check it out. Thanks!